and Frances Keller. Robinette married Francis Simerl on Aug. 14, 1954 in Chicago, Ill. Robinette was a teacher, homemaker and a columnist for the Belvidere Daily Republican. 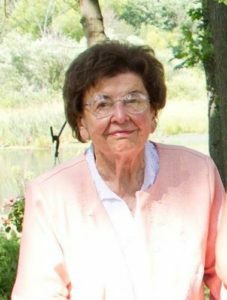 She was a member of the Belvidere Garden Club, Ned Hollister Bird Club, and Belvidere Women’s Club. She was passionate about classical music, reading, writing, and going to the opera. Robinette is survived by her daughter, Elizabeth (Bradley) Straw; grandchildren, Sherri (David) Gretschmann, Jason (Megan) Straw, Addison Barrone; great-grandchildren, Ariyanna, Oliver and special nieces and nephews. She is preceded in death by her husband; son, David Simerl; parents, 3 sisters and 1 brother. A memorial Service will be at 4 p.m., Saturday, Oct. 20, at Hunter United Methodist Church, 3315 Hunter Rd, Caledonia, Ill. 61011 with Rev. Tom Hay officiating. A visitation will be from 3 p.m. till time of service. Cremation rites have been accorded. Memorials to the family, which will be donated to the Merri Milk Maids. To light a candle or share a condolence please visit www.AndersonFCS.com.